In your oppinion, who makes the best c/s/b coins? Pictured to the left my hero and me during FISM 2006 in Stockholm. I am not sure if Todd is making them right now, but get one if you can. This set is a real worker. I'll go with Todd, too. 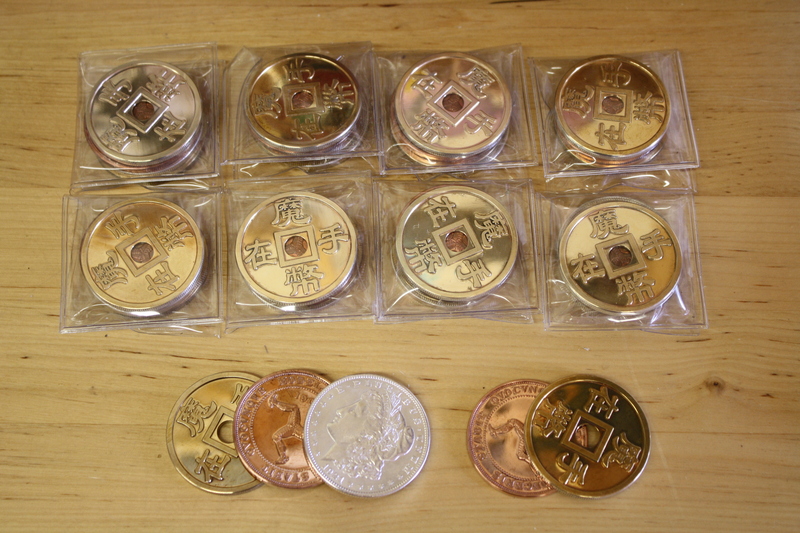 I have a hole coin set and a solid set. Lassen make's the best CSB set available out there. Lassen makes the best. I still recommend Johnson Products to start with for economical reasons and for magicians to find out what it's like handling the set. Does anyone have the homesite to Lassen? Hi ! I also bought a Lassen Commercial CSB set and it is indeed a beautiful one at a very reasonable price. Much better quality than Tango and not that much more expensive. Xavier Belmont sent me a few pictures of one of his latest CSB set (wih a 1921 Morgan) and, well… I know what my next set is going to be ! Obviously, it's not in the same price range but Xavier's reputation is second to none (plus, he has the best customer service I've seen). Lassen makes some beautiful sets! I understand Lassen actually has his own exotic coins minted to exacting specifications, such as the Peruvian Sol De Oro, to create the precise fit. No More Room In Hell..
For the price, I have been really happy with my Johnson set. I sent them the coins and they did a custom one for me. Custom is always an option with them if you catch them at the right time. Allen, Thanks for the reminder! I love Lassen have quite a number of his products. I use his shell sets, Morgan flipper coin, and jumping halves. But I do have, and use, a nice set I got from Schoolcraft about ten years ago, East African dime, American liberty half dollar, Mexican centavo. I have another Todd Lassen set than the one shown here (yes with the little mark inside). It's perfect as well. I also have a set from Jaime Schoolcraft and the difference is only in the type of coins, not on the quality of craftmanship. Now I could perform with much cheaper sets as well. The quality of such sets is only for self satisfaction and the fanatic comments about this or that particular quality by one or the other are rarely linked to performance reasons but more for a form of snobism. Now craftsmen have exclusivities and any magician may wish to purchase the necessary gaffed coins from them for some special routines. But when it comes to a Shell Set or a Gravity Flipper, the fanatism shown on this topic for any craftsman is really without performing ground and somewhat ridiculous, betraying more the ignorance of the writers than the "knowledge" they think they acquired when acquiring a very nice set. Todd Lassen is episodically generating a debate in this topic to suggest by "in Transit Actions" that he is the best craaftsman in the world. It works commercially but he has several peers whose quality is in no way inferior, despite what he tries to get inferred. Furthermore, contrary to what people try to state he had, like every good craftsmen, some coins that he had to swallow back for defects, sometimes graciously and sometimes not. I like Todd Lassen's work, globally not more than the one of the four or five top craftsmen in the world, but his after sale service, from comments here in the Café by several magicians, is not to be emulated and he has, according to my personal experience, the most arrogant personality and, by far, the most despicable manners. to the gaff. It's way too thick and way too obvious in dollar size. You could never hold the gaffus in front of a spec and show the edge of the gaff. And opening a Lassen flipper is to die for. Lawrence, I understand what you are trying to say now. It's an interesting point you bring up about Tango. Their reputation has always been so bad that I have never considered getting anything from them. It's been years since I've seen their work, but I remember not being too impressed at the time. I have been pretty confused lately when I have seen some of their products for higher prices than some of the big names.